Make her day with a delicious assortment of Cheryl's desserts delivered in pretty packages! She will love this gift! 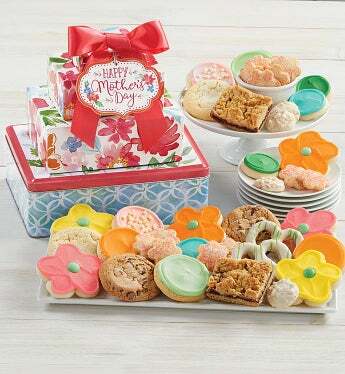 We've included our buttercream frosted flower cut-out cookies, along with delicious flavors like chocolate chocolate chip, old fashioned sugar and classic chocolate chip cookies. The gift tower will also include sweet and salty pretzel clusters, gourmet drizzled pretzels and much more!